I am now recommending it for my book club to read. It was very well written, and tough to put down! I’m looking forward to more books from this author. (The) wonderful writing style reflects many deep emotions felt throughout the entire novel for all characters involved. Insightful and a real page turner!! Two thumbs up!! I wouldn’t normally choose this book, but I actually enjoyed it very much. Thanks Sandy, wherever you are–I consider it a high compliment! Most of my sales have been in paperback, though I’m encouraged by all the eReader interest–lots of people love their eBooks. Online, there are five retailers offering The God of Sno Cone Blue, and you can access them all here. But if you prefer brick-and-mortar shopping and you live in the area, the paperback is also in two wonderful bookstores: New Renaissance in downtown Portland, and Jacobsen’s in Hillsboro, Oregon. 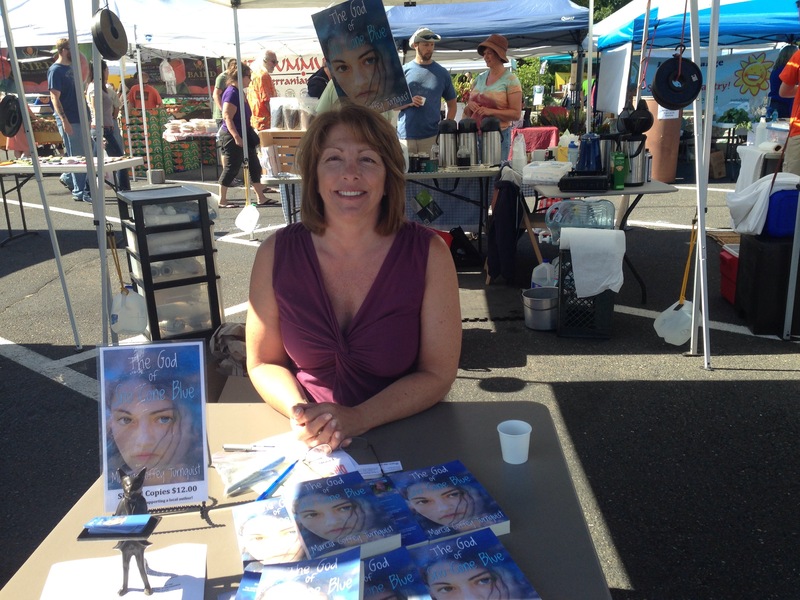 I’m investing plenty of time online learning the ropes of marketing, but, truth be told, I prefer meeting readers in person, and so I’ve spent several Saturdays at the Cedar Mill Farmers’ Market on Cornell Road, the source of the picture in this post. You’ll find fabulous products there, by the way, like fresh produce and flowers, jewelry, food and pastry (not to mention one promising book). I’ll be there most Saturdays this summer and fall, including this weekend. So stop by if you’re in the area–I’d love to see you. If Saturday is not in the cards, but you’d still like to help, let your friends know about my book. 500 in sales is a happy milestone, but I’d like to make it–perhaps one day soon–seem quaint. This entry was posted in News and tagged 5-star reviews, 500 books sold, 500 in sales, Cedar Mill Farmers' Market, eBook, eReader, Jacobsen's Books & More, national reviewer, New Renaissance Bookshop, page turner, paperback, positive feedback, the god of sno cone blue by Marcia Coffey Turnquist. Bookmark the permalink. Marcia, I’m so impressed and happy for you. It’s very fun knowing a legitimate author! Congratulations. Thanks Joni. I need all the support I can get! Yes, Vicki, just over 500 and counting! Marcia~congratulations!!! Here’s to many, many more. Thank you, Beth, and that’s the plan!